GUITAR RIG est un ensemble d'outils pour guitariste qu'il soit sur scène, en studio ou chez lui. Cet ensemble est composé d'un logiciel et d'un pédalier de contrôle hardware, le "rig kontrol". La partie soft offre des émulations d'amplis et de micros ainsi que des effets, permettant au guitariste de créer sa configuration. The Van 51 delivers superstar signature sound from hard rock to blistering crunch — great for drop tunings and menacing palm-muted chug. The Hot Solo+ recalls a classic hand-wired amp with a boutique, responsive overdriven tone. For expressive, singing solos that still sound heavy as hell, the Hot Solo+ is your amp. Fast Comp — A warm, vintage-style compressor for keeping your peaks in check. Essential for clean sounds. Vintage Verb — Eight different classic plate and spring reverbs. Not just for retro — also great for adding class and character. Little Reflektor — Advanced convolution reverb, based on the acclaimed REFLEKTOR, with eight impulse responses plus decay and low cut control. Stereo Tune — Not a tuner! Spreads and detunes the stereo image for a fatter sound and de-tuned effects. Filterbank — Drastically transform your sound with this powerful 8-band filter, with a global frequency shift and stretch parameter for highly expressive effects. Resochord — Turn notes into chords and get shimmering, resonating sci-fi chorus with this six-pole harmonizer. The new Container is a utility module for creating and storing multi-effects and custom channel strips. Assemble your processing chain, then assign the eight macro-controls to the key controls on any of the effects in the chain. It's a great way to get simple control over your sound, and an essential tool for performance. Extending the already comprehensive mix options in the Control Room, the new 'Pro' version gives you eight custom setups at once, for the ultimate in extravagant, almost limitless fine-tuning. Arm each track of the 8-track mixer with your choice of cabinet, mics and positioning. Choose from 27 cabinets, up to 16 microphones and up to three mic positions, including room mics. Then juggle the levels for intense sonic perfection. The sound designers at NATIVE INSTRUMENTS have been busy with the new amps and effects, and they've created over 130 new presets. Highlights include an array of warm, absolutely realistic clean sounds, a number of searing distortion presets and ready-to-use multi FX. Side-chaining is an extremely useful technique for reducing sonic clutter and creative 'pumping' effects. GUITAR RIG 5 PRO adds side-chain inputs to a number of compressors and Modifier modules, making it easy to incorporate this technique into your effects chains. This all-new module opens a vast new world of tone with an unparalleled degree of natural sound reproduction and tonal clarity. With just a few fader moves you can create the sound of professional studio recordings that will definitely cut through the mix. GUITAR RIG 4 PRO's new amps bridge the gap between vintage goodness and future classic. Cool Plex and Hot Plex must be heard to be believed. New tools to transform your sound include Grain Delay, Octaverb, Iceverb and Twin Delay. This new feature allows you to keep any chain of effects while changing presets, to create variations of your basic sound that can be switched in real-time. For example- add overlapping delays or reverbs to your guitar when switching presets for a smooth transition, or add global effects orEQs for adapting all presets at once. Great for live use on stage and when switching to another guitar! 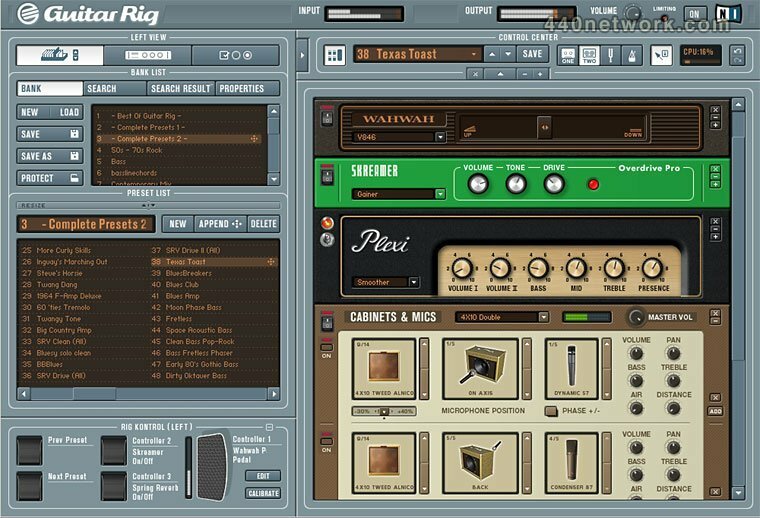 GUITAR RIG 4 PRO comes with over 250 studio-ready presets. Use them as instantly usable pro-quality tones or as a starting point for your own tweaks. GUITAR RIG 3 contains four new select amp models, further expanding the enormous sound palette. Special attention has been focused on developing still more authentic and dynamic tube sounds. We are proud to present even more impressive amplifiers with unequaled sound quality. For each amplifier as well as the Cabinets & Mic modules, a matching guitar box has been created. For each of the twelve tube amps GUITAR RIG 3 has styled a perfectly tuned and enormously simplified cabinet, which reproduces the sound of the original box. Here you can choose between two different microphone types, and select the different characteristics of each. This makes it easy to arrive at your desired sound in seconds, without needing the extensive knowledge of a sound engineer. All functions such as the headline and the toolbar have been optimized- a simpler layout and clearer arrangement leads to a substantially improved work flow. You can now assign several functions to any button of the Rig Kontrol 3, so that as many effects as desired can be switched on or off at the same time. The new Snapshot function permits the placing of different variations of a rack making the switching between complex sounds very fast - great for live situations. 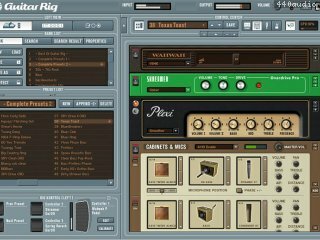 GUITAR RIG 3 comes with a completely re-arranged sound library. The enormous sound pallete with 300 presets and/or preset setups brings you a gigantic selection of typical guitar sounds - for each amplifier model common and co-ordinated setups are provided for fast selection (e.g.- from clean to crunch or hi-gain) - or search for your sounds using typical music styles from classic rock to pop to metal. GUITAR RIG 3 has developed the "live-view" specifically for live situations. This view contains only the most important information and parameters optimized to make GUITAR RIG 3 the unbeatable tool for the stage - even from several meters distance everything is still in clear view. Automation for the 3 new components from version 2.2 added. AIFF import on Intel-based Macs fixed. Crash in tape deck fixed. Crash when enabling/disabling the Tapedeck time stretch fixed. Load Bank dialogue appears twice - fixed. Saving banks+presets will delete first/last preset - fixed. 'AllSoundOff' command does not clear audio buffer - fixed. Wrong order in the application menu under OS X fixed. Rig Kontrol 2 : contrôleur au pied, avec interface audio et MIDI en USB2, ce qui permet d'avoir une solution complète matérielle et logicielle. Cinq nouvelles encientes guitares et six nouvelles enceintes basse, ainsi que trois nouveaux microphones pour la basse. Loop Machine : Bouclez des parties et créez des overdubs en temps réel. I'm conflicted about rating the software, becuase when it works, it is fantastic. there is nothing on the market that comes close. i purchased the original GR and had great luck with it. it installed easily, worked great. i played out live with it and had great results. but after waiting many, many months to get a universal binary release, i still don't have it working. they were completely unresponsive to their customers during the 10 plus months we had to wait for universal binary. 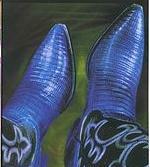 toward the end, they started finally responding on the forums saying very simply, "please be patient." at this point, they had missed their own promised deadlines over 5 times without telling anyone. they would just quietly change the due date on an obscure page of their site. i purchased the software only upgrade thinking i could use the original hardware controller. after a couple months of trying to get it to work, and reading a novel worth of forum posts, i finally broke down and just bought the full 2nd version with the new controller. then i got into the same situation RegHater had. I installed it, and it didnt work. dug around and found out that there were upgrades. So i had to install several updates, each one requiring a reboot. also i had to authenticate (which i didn't want to do until i got my refund for the software only version). after all that, it still didnt work. their offices close at 5, so i couldnt get support except through a web form. the instructions do not do a good job of explaining the differences between GR1 and GR2, which are fundamental in nature. No one from NI answers the forums. their software is counterintuitive to install, time consuming to setup, the instructions are extremely limited with no troubleshooting or explanation of what to do when it doesnt work. and i can guarantee there will be a time when it doesnt work. other than that the software is great, when it works. the sound is incredible. i just hate the fact that NI is the company behind it. 2.2.1 is out now, but bypass still doesn't work with Digital Performer 5.1.1. If you go to their website and log in, if shows version 2.2.0 was released January 25th 2007....I don't get it. So far, I am impressed! The ability to instantly switch between presets is getting better and better... Amazing software! This product has amazing potential, but I'm a little concerned about a few glitches, the hardware, and the company's militant stance against their customers. (Even their voicemail (which I got during business hours Friday afternoon) sounds impatient and grouchy) For the $500 list price, you can get some pretty good dedicated hardware products that may be more usable/dependable in a live situation. If you already have a high speed computer, audio interface, some good monitors and use DAW software this is a purchase to consider... Time will tell if they make it worth it. I'm once of those guys who owns several thousands of dollars worth of pro audio software, and I hate it when these companies make you jump through hoops to use the software you've bought. (My $600+ investment in Bitheadz Unity Session is now toast since they're out of business) On the other hand Mark of the Unicorn has made Digital Performer very reasonably simple to authorize and reinstall if needed. Using it: Well the tone and the ability to edit it is nothing short of pretty amazing, and I think that's the saving grace of this product. Using it live will be a challenge because there's a pause, glitch, or slow fade, when changing from 1 preset to another. Hope this gets fixed sometime soon. The lack of any display on the foot controller means you're going to be looking at your computer screen to see what sound you're selecting. Yes, the sound and editing capabilities are amazing making this a nice addition to the studio, but what about live?